My neighbour Kevin often hosts musician Eddie Coffey for a stopover on his many gigs. He is a very interesting guy, a real hard working musician from The Rock. For years I have wanted to photograph him so last time he was down we did a quick shoot using the 8x10 Deardorff. For the last series of shots we did that day we got his accordion, and for me, a spark ignited in him once he got his hands on his accordion and started to play. They also mentioned that they might be using these shots for an album/CD cover, so I mocked up this design and title for them. I was doing some research on Newfoundland sayings and I love this one especially for Eddie as he is always on the go. The saying means a good wish for the future, may there always be wind in your sails a nice sentiment, Long May Your Big Jib Draw everyone. Very curious to see if they like the shots and the album cover design. 8x10 film produces some of the most detailed images you will ever see and it has amazing latitude for exposure. It is very hard screw up your exposure given the film's latitude. I love shooting with this camera looking through he back of the camera is magical, the world is upside and reversed. It forces you to slow down and focus on what you are doing. For the first time shooter or those getting into portraiture this is not the camera for you though there is too many things to remember and do. Focusing, metering, stopping down the lens, inserting the film, reversing the dark slide, etc... When you feel more comfortable posing and talking with clients then step up to this beautiful beast. 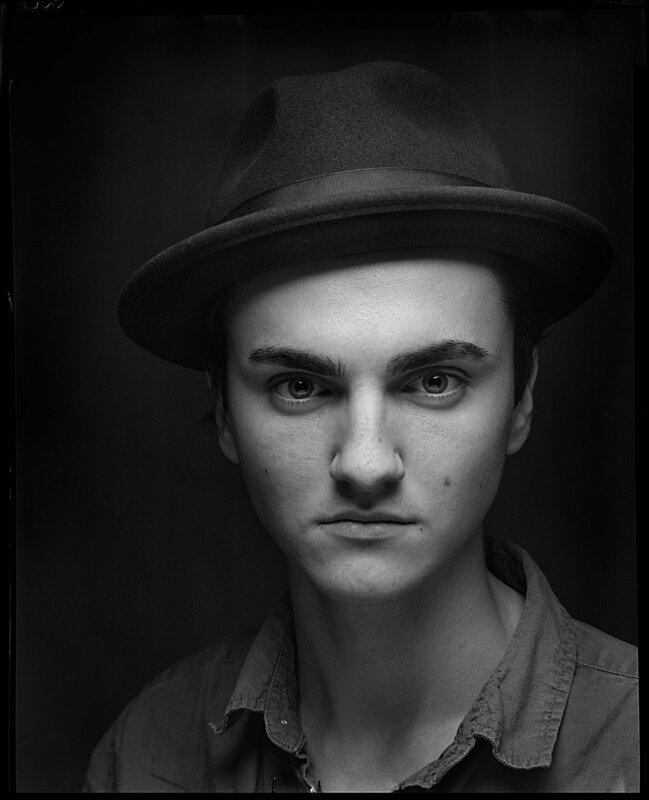 Tips, for any student of photography I highly recommend trying out a large format camera while in school. The experience will alter your perspective or, at the very least, make you appreciate digital capture even more. Besides slowing you down while photographing with a view camera it will also brings back a little of the magic of photography for the client and yourself, because the camera is so big and looks so simple and archaic it could never produce an image. I always try to let the client view the back of the camera too, this just amazes them how big and bright the image is under the dark cloth. So for my students come see me and I can hook you up!! 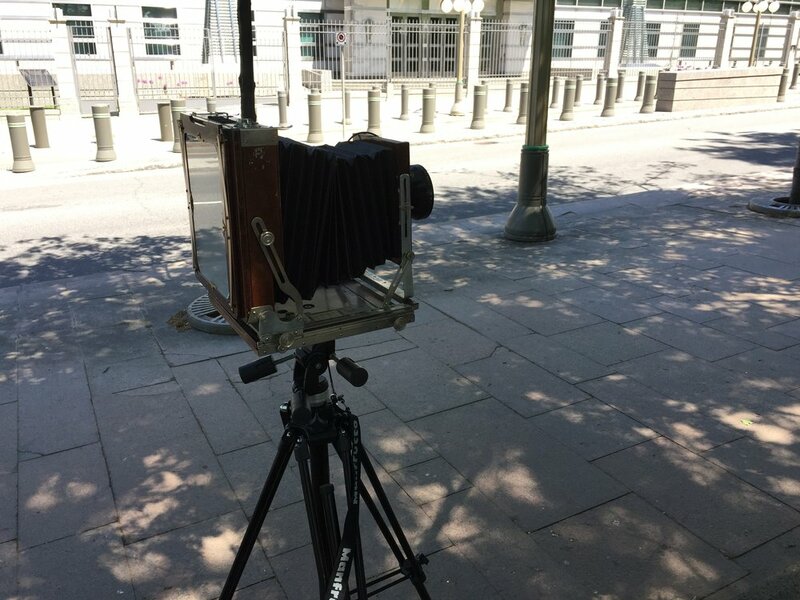 I really like using the tilt on the this camera but the 8x10 field camera is not very precise and is missing a front swing and very limited rear movements. 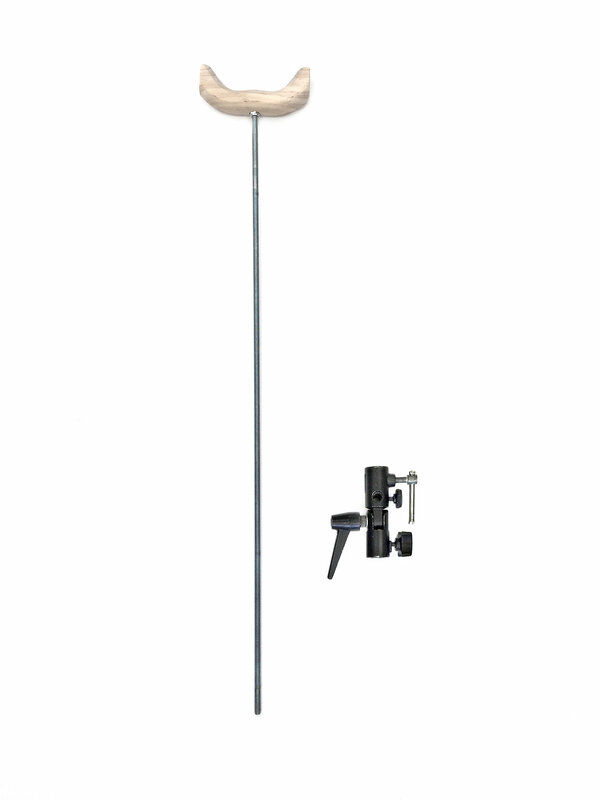 I do have access to a Sinar P2 which has the full range of view camera movements and very precise handling so I might be using this for some of the images for my MA. For my Emerging From Darkness series I want to incorporate the use of movements to give the appearance of the subject not only emerging from darkness but also focus. So the use of camera movement is something I will revisit but with a more precise camera. A concern of mine while shooting with the 8x10 in studio was that even though I was using a Speedotron 2401 pack at full power I was only getting f/64. Based on my subject distance, and the focal length, I figured out that I only had a 6” window of focus. So I spent my time constantly checking focus as the subjects kept moving, which is fine with an autofocus camera but not so good with a view camera, especially as you have to stop down the lens and load a film holder before you shoot. After reviewing the images most were in focus but I still had some concerns so I started researching photographer’s head rests, to help keep the subject’s head in place. Surprisingly, ha ha, these items are not readily available at your local camera store anymore, so I decided to build one of my own. Opted for the non-screw or pincher type and opted instead for more of a head rest. For the base and support I decided on using a studio stand, a sandbag, and a Manfrotto Lite-Tite to attach the head rest to the stand. The Lite-Tite would give me the angle I wanted and the ability to adjust it if needed. The diameter of the umbrella holder hole on the Manfrotto Lite-Tite is 3/8”, so the the screw shaft had to be the same. I counter sunk the holes on the Float Pad Handle with the 9/16” drill spade to recess the locknuts. Wanted to make sure that the locknuts did not poke into the sitters head, ouch. I then cut off the ends fo the Float Pad Handle so you wold not see it, and viola a homemade head rest, see Fig 2 for the completed kit. I plan to paint the head rest black as most of my portraits will be shot against a black or dark background. The head rest with the drill spades cost me $21 and it took me about 15 minutes to assemble. I have since cut down the screw shaft enabling me to make two out of the one shaft. By the way Photo Buddy is a great app for view camera and film shooters it has just about everything you need, helping you figure out exposure factor, reciprocity, hyperlocal distance, depth of field and a lot more. This app is something I always use when shooting with the 8x10 or 4x5 view cameras. I start my History of Photography classes by building a camera obscura room. The windows of the room are blacked out and through a single small hole in the window covering an image is projected onto the opposite wall, it is reversed and upside down. For me this is the camera at its most fundamental level and it is quite amazing to witness. When a car or bus goes by and is projected onto the back wall the room erupts in gasps, my students are amazed at this phenomena. The same is true when I show my students the large wooden Deardorff 8x10 view cameras, they are always amazed that they still work and produce photographs. For many of my students the cameras, most likely produced after the 1950s, appear to be from the dawn of photography. The size of the camera is also astounding to most and as one student put it “almost magical” when the world is projected on the ground glass at the back of the camera, reversed and upside down. Encouraged to try different photographic process by my MA tutor and curious to see what kind of reaction and interaction I would get if I used the 8x10 camera, I decided to go out and photograph random people on the street. Would the sense of amazement elicited by my students be duplicated by people in the street and how would this effect the photographic process. After setting up the camera on the street I quickly realized that it would elicit that sense of amazement; people did a double take and stopped to ask questions, wanted to see the projected image, know the camera’s age and what I was doing. For most people I engaged with the camera was a little surreal to see in use, and this hook did make it easy to get people to pose for a portrait. Another thing I noticed was that the rather rigid and laborious process of taking a photograph, with an 8x10 view camera, created a more intimate interaction with the subject. My initial assumption was to rush the picture taking process so as not to bore or loose the interest of the subjects, however, slowing down and explaining the process while doing it increased the engagement. The subjects continued to be very curious about the process, the film itself, and the project. The more care and thoroughness I displayed equaled an increase in reverence for the process and the experience by the subject. It also gave me and the subject more time to talk which was very enjoyable. Figure 1: Mr. Ulrich (Source: Machinski, 2018). To get a sense of the exposure process with an 8x10 view camera here are my steps, I firmly hold true to the carpentry adage, measure twice and cut once to get a desired result. Pre-focus on marked spot in frame before subject is there. Measure bellows to account for any exposure compensation. If compensation is needed perform calculation and adjust exposure. Take notes of exposure and any compensation. Ask subject(s) to stand in marked spot and not to move to much. Open up the lens to focus. Under the dark cloth re-focus. Quickly re-measure bellows to see if any further exposure compensation is needed after focusing. Re-insert film slide, black side out. Tape down film holder top, label and put inside camera bag. The 8x10 view camera is a very interesting photographic tool it definitely has a certain presence, the process of taking an image with it slows you down and elicits a unique interaction with a subject. The large negative produces a lot of detail and has an amazing exposure latitude. The drawbacks are it is a slower process to meter and confirm exposure, you need a lot of light because the depth of field even at high apertures is very shallow, and the cost of film and processing, while not excessive is still something to consider. The cost of one photograph including film processing is $9.80 CAD. This does not include scanning or printing the negative, scanning from a lab can cost $5 CAD for a flatbed scan and $40 CAD for a higher resolution drum scan. The technical drawbacks are easy to work around by pre-scouting locations and using lighting and/or reflectors and to confirm exposure and depth of field is a lot easier to do now using an iPhone app, PhotoBuddy. For me the drawbacks are interesting challenges and with a little pre-planning and research are easily overcome, which then makes taking photographs with an 8x10 quite enjoyable, it also reaffirmed many things about the craft of photography for me. First, that no matter what tool a photographer uses the act of photography is really about a relationship between the photographer and the subject. Second, whether it is a landscape, product or a person a photographer should actively engage with and/or understand something about the subject. Lastly, slow down and get the portrait subject to participate in the process, this gives ownership to the subject and gets them more excited about the photographic process. This excitement and reverence for photography is something I think can get lost in this age of digital photography and Instagram. Thanks to all those who stopped for a portrait, there is more to come. Figure 2: Marie-Éve & Ian (Source: Machinski, 2018). Figure 3: 8x10 Camera Setup (Source: Machinski, 2018). Figure 3: Camera setup and focused to the maximum distance based on the 360mm lens, without need for exposure compensation. 360mm lens is about the equivalent of a 50mm lens on a full frame DSLR. The large reflective building to the left of the camera fills in some light, lightening the area. Figure 4: Perspective (Source: Machinski, 2018). Figure 4: I like photographing with a background that has a lot of linear perspective. It focuses the viewer’s attention attention on the subject if placed at the vanishing point and I like that it enhances the shallow depth of field. Figure 5: Gear Marie-Éve & Ian (Source: Machinski, 2018). 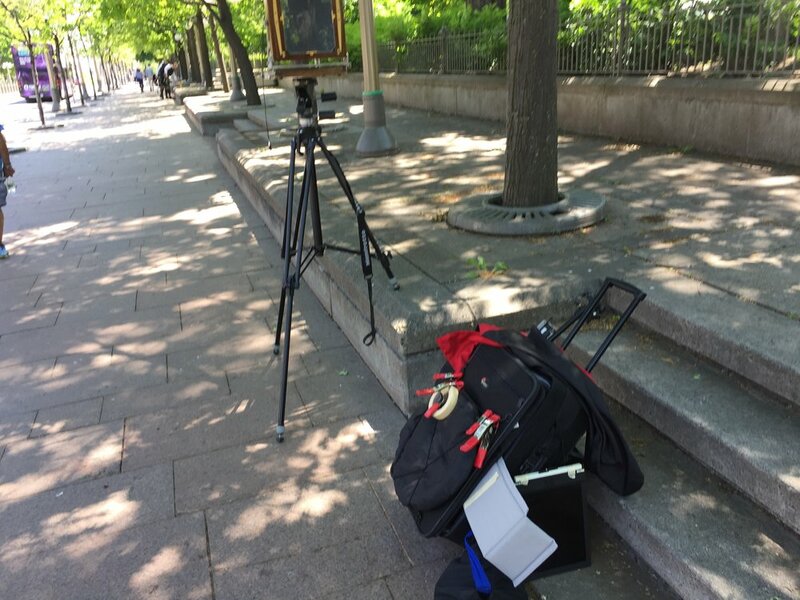 Figure 5: Traveling with a rolling bag helps as the gear is very large and heavy, and a lot of accessories are needed to make the photography go smoothly i.e. a clamps, dark cloth, meter, tape, measuring tape, etc..
Machinski, J. (2018) Mr. Ulrich. June 2018. Unpublished. Machinski, J. (2018) Marie-Éve & Ian. June 2018. Unpublished. Machinski, J. (2018) Camera Setup. June 2018. Unpublished. Machinski, J. (2018) Perspective. June 2018. Unpublished. Machinski, J. (2018) Gear. June 2018. Unpublished.